Last year Deaf Aotearoa started a new organisation structure and new way of providing serivces. To reflect this, Deaf Aoteaora has been working on re-freshing its logos and brand. The re-freshed brands bring our organisation together so all our logos are like a family but still have different parts. It has been a long process inside Deaf Aotearoa and now we are pleased to share the re-freshed brands with our community! 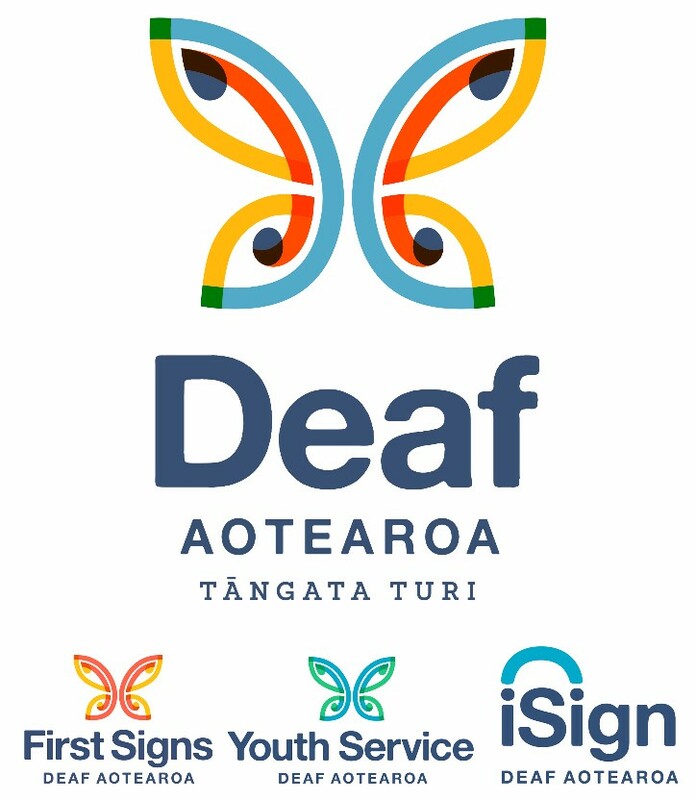 Deaf Aotearoa – this is the main brand that you will see around our offices, business cards, letterheads, etc. You can see they all link together nicely, and show that all of the different parts of the organisation are tied together by common themes. You will start to see the new logos in different places over the next couple of months leading into NZSL Week, and we will also be launching a new website for First Signs, as well as updating our existing websites throughout this year. This is an exciting opportunity for you to give YOUR thoughts and feedback about NZSL Weeks 2007-2015. Please complete the survey by Friday 15th April 2016. On behalf of the New Zealand Sign Language (NZSL) Board, I am thrilled to announce the release of the NZSL Board Action Plan 2016-2018 (the Plan). The Plan, the first of its kind since NZSL was made an official language in 2006, is a significant step in developing an effective and coordinated approach to achieving improvements for NZSL and the Deaf community in New Zealand. The Plan reflects ideas and feedback from the Deaf community in two ways. Firstly, the NZSL Board itself has members who are vastly experienced in issues affecting NZSL and Deaf people. The NZSL Board prepared a draft Plan, and then in late 2015 undertook an extensive consultation with Deaf communities all over New Zealand. The feedback from those consultations reinforced and refined the Plan. An important aspect of the Plan is that all of the actions it contains have been supported with commitments from Government. Such support is essential in making the actions a reality. 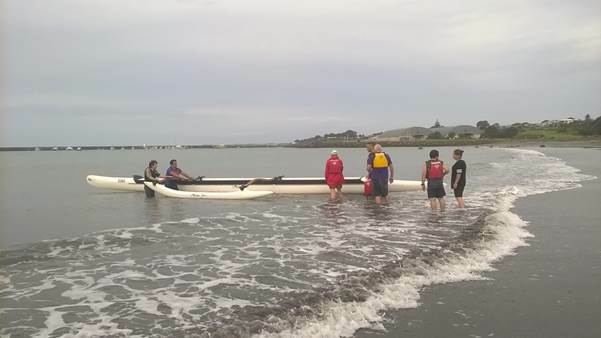 The NZSL Board will monitor progress in the implementation of the Plan over the next three years via reports from the relevant government agencies. The Plan is based around the five priorities that Cabinet approved when the NZSL Board was first established. Each of those priorities now has one or more actions to focus progress over the next three years. I encourage all interested stakeholders to read and/or view the Plan in NZSL to better understand the work that the NZSL Board will be undertaking, and what it is aiming to achieve. Executive Board members will be there. Registration for taster classes is now OPEN! 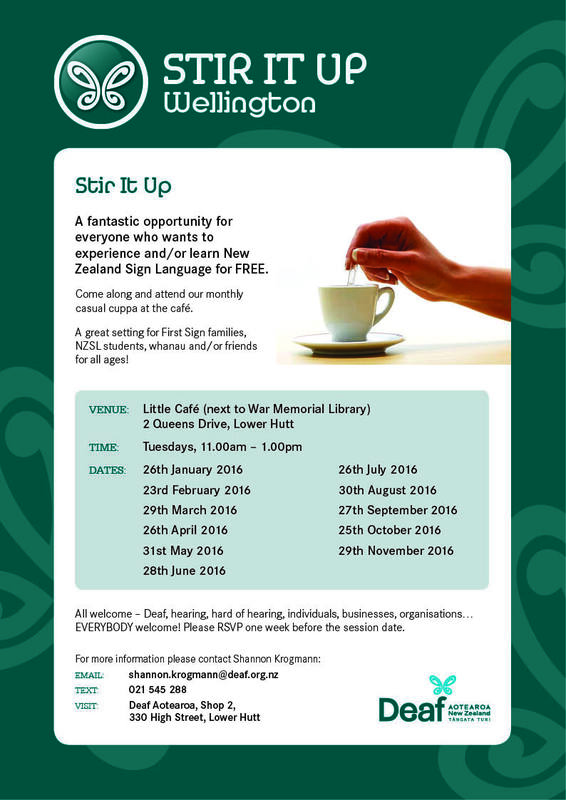 Every May, Deaf Aotearoa promotes New Zealand Sign Language (NZSL). As part of this event, Deaf Aotearoa provides FREE 45-minute NZSL classes to businesses and organisations like education, community, Maori or healthcare service provides around the country. Classes are limited, so sign up now! 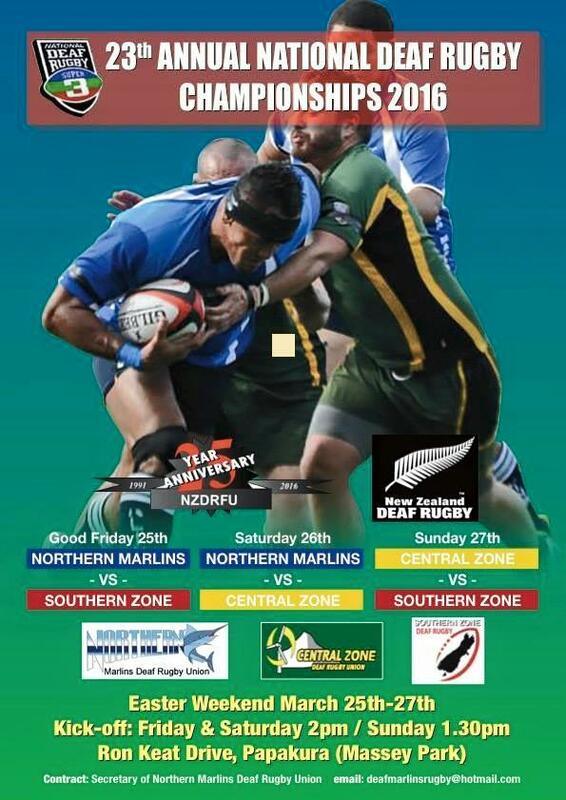 For more information, visit Deaf Aotearoa near you or contact us on 0800 332 322. Over the past five years the WHAT weekend has rapidly grown to become one of the biggest events on the Northland Arts calendar. Visitors and Artists from all over Northland come to take part in the vibrant two day Easter Exhibition. This year 38 Artists will be exhibiting in 19 locations spread along 30km of stunning coastline. Entry to all studios and community venues is free but to make the most of your visit please buy a $5 trail guide with raffle ticket included. We are offering 6 great prizes donated by exhibiting artists so why not buy two! 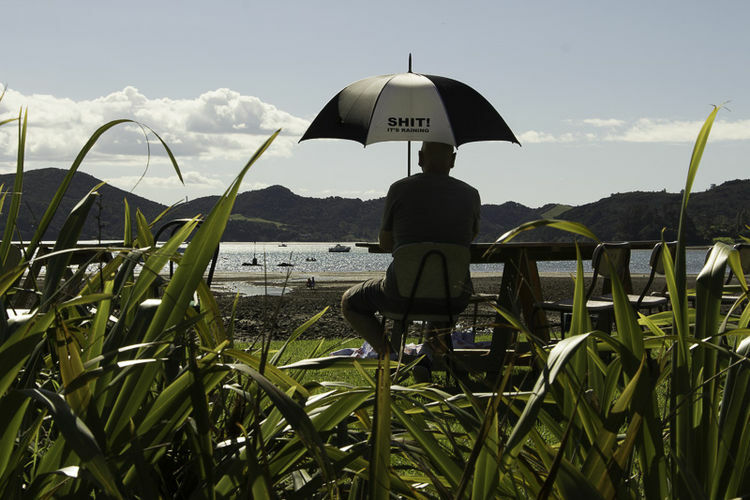 Trail guides are now available at The Hub in Whangarei Town Basin, Whangarei iSite on SH1 or Newday Cafe in Parua Bay. 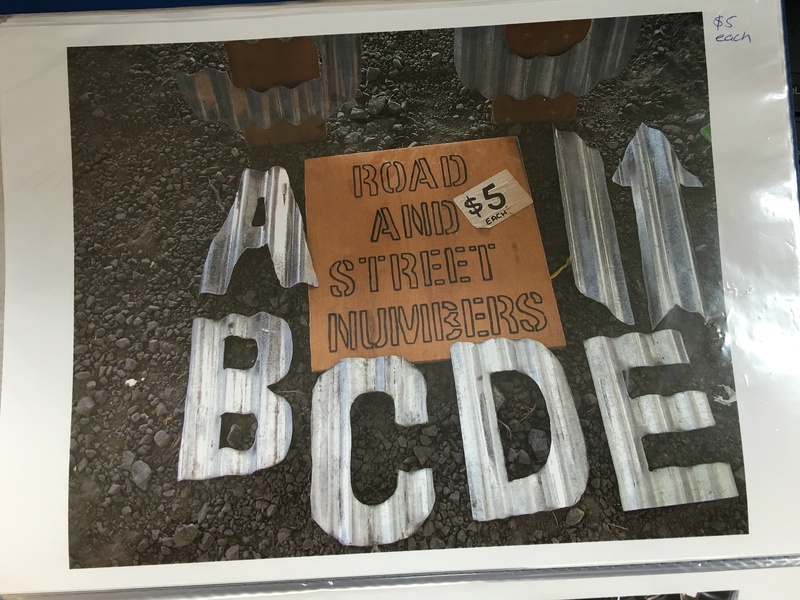 Guides will be available on the day in any community venue - all on Whangarei Heads Road. 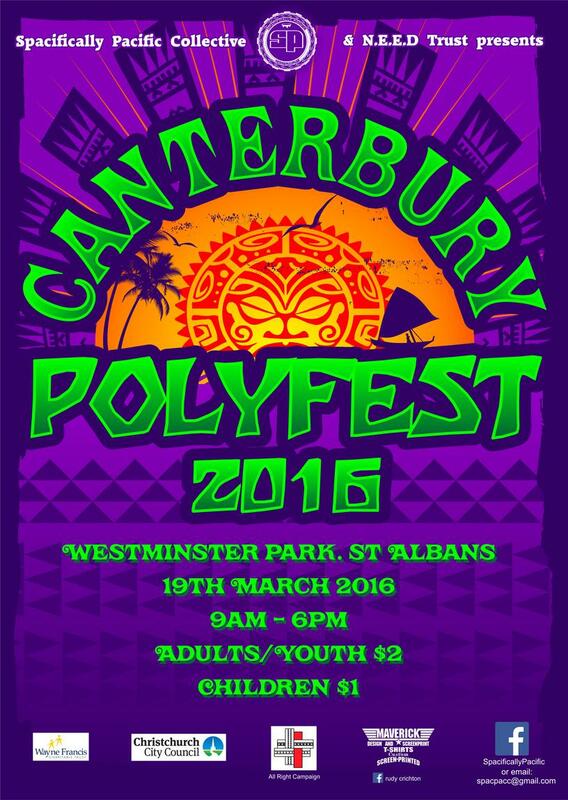 These are: Tamaterau Hall, Parua Bay Community Hall, McLeod Bay Hall, Whangarei Heads School or Taurikura Hall. Please check out our web site for more information and put the date in your diary today. Jesus Christ Superstar – Interpreted Show! Harlequin Musical Theatre proudly presents "Jesus Christ Superstar", the global phenomenon that has wowed audiences for over 40 years. Tim Rice and Andrew Lloyd Webber’s groundbreaking rock musical will hit the stage in Auckland this May, with an extraordinary cast of 40+ actors, singers, dancer and musicians. The world renowned musical tells the biblical story of Jesus Christ's final days of life. Over two thousand years ago, Jesus Christ is being hailed as the messiah of Judea. Nervous about losing their power, the Romans, with the help of Judas, find and arrest Jesus and crucify him. 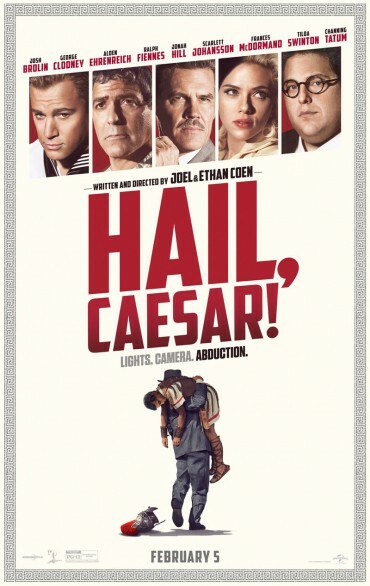 The story is told mainly from the perspective of Judas, the disciple who eventually betrays Jesus and turns him in to the Roman authorities. Proudly Supporting New Zealand Sign Language week (9th – 15th May, 2016). When: 30th April – 14th May 2016. 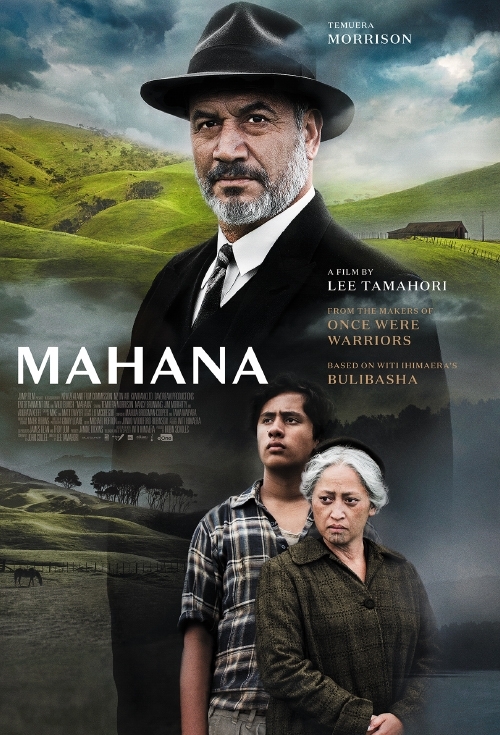 Wednesday 11th May performance will be NZ Sign Language interpreted followed by Q&A session with the cast and crew. Contact if you wish to join. 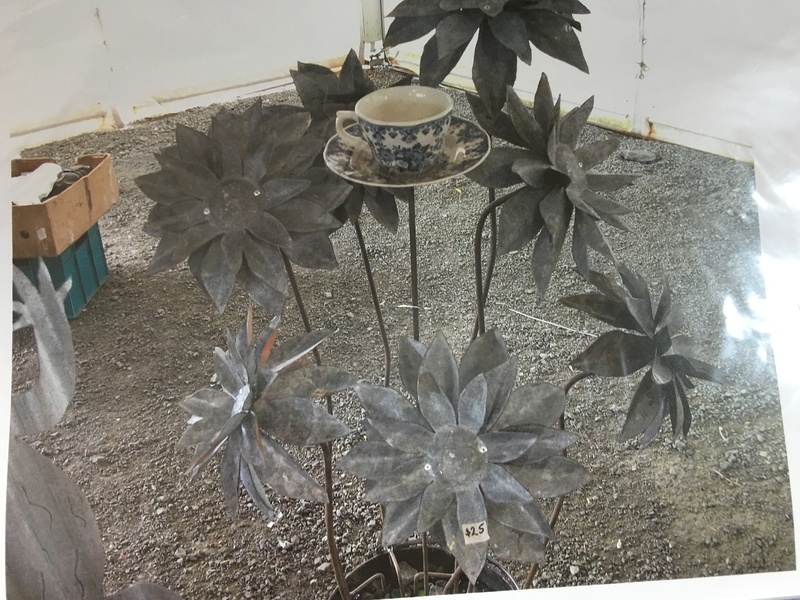 Lyndelle Coats from the Deaf community creates lots of art work from iron! She can make a number of different things like animals (butterflies, chickens, dogs etc), letters and numbers etc. 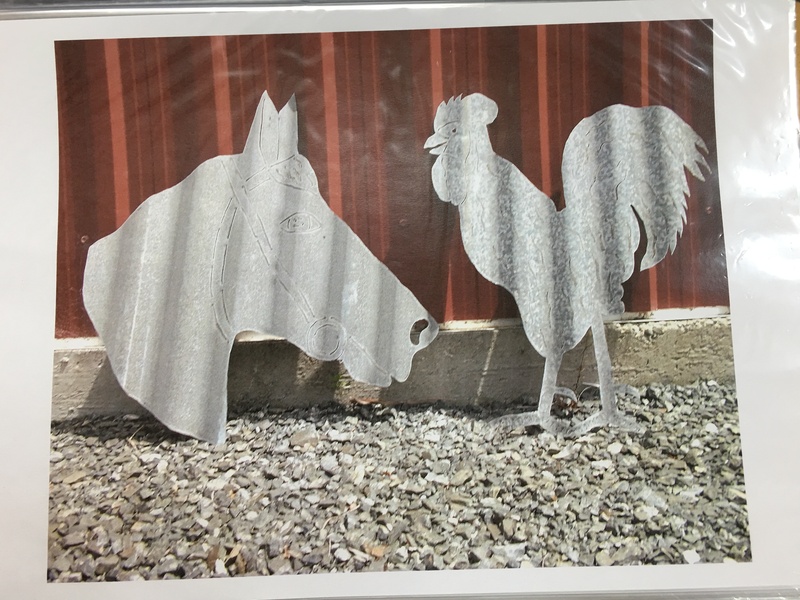 Please contact Lyndelle if you would like to purchase some of her work of have a special piece created for you. 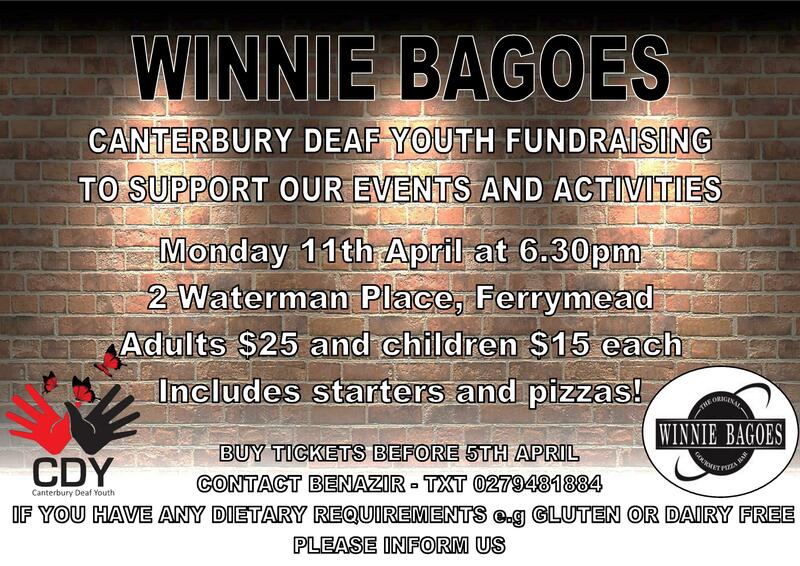 Venue: Deaf Aotearoa South Auckland office. This is a great opportunity for everyone who want to learn NZSL and this is for all ages. The Royal Easter Show will have lots of things to do, circus acts, rides and shows, plus the A+P Show! You can feed lambs, go on a huge ride, ice skating or watch the Zirka Circus. We will be closed for Easter from Friday 25th March to Monday 28th March. The office will reopen on Tuesday 28th March. We hope that you have great Easter break. 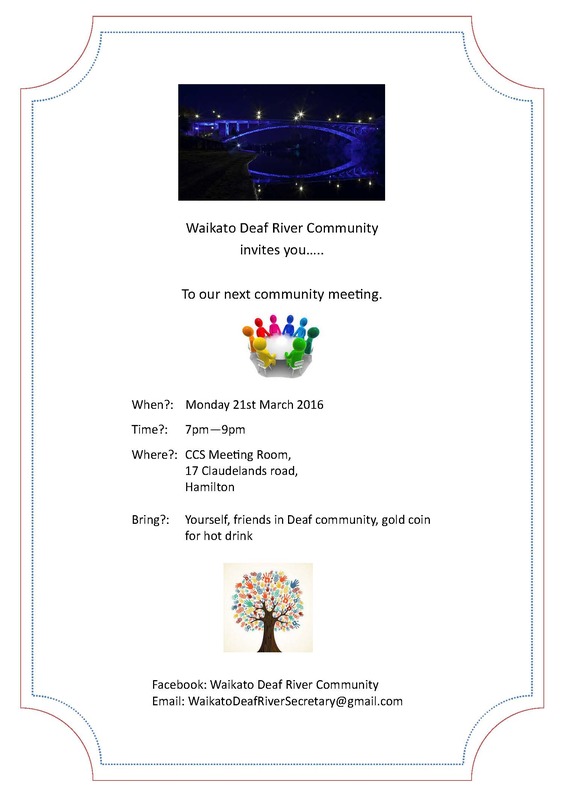 Waikato Deaf River community invites you to our next community meeting. 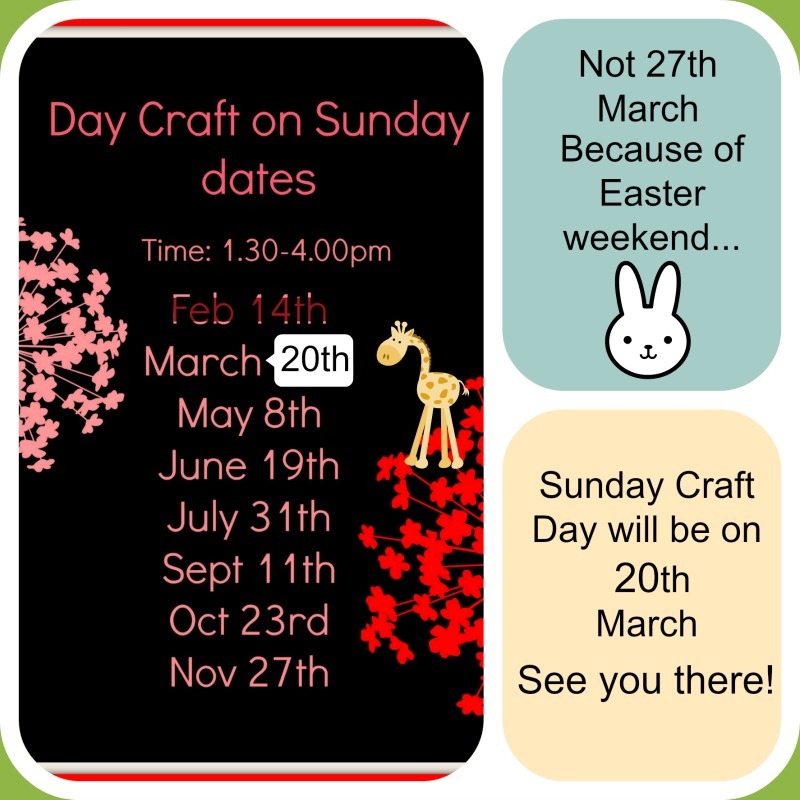 To crafters, my apologies for the oversight on 27th (it’s easter). All these dates (on flyer) are secure for 2016. 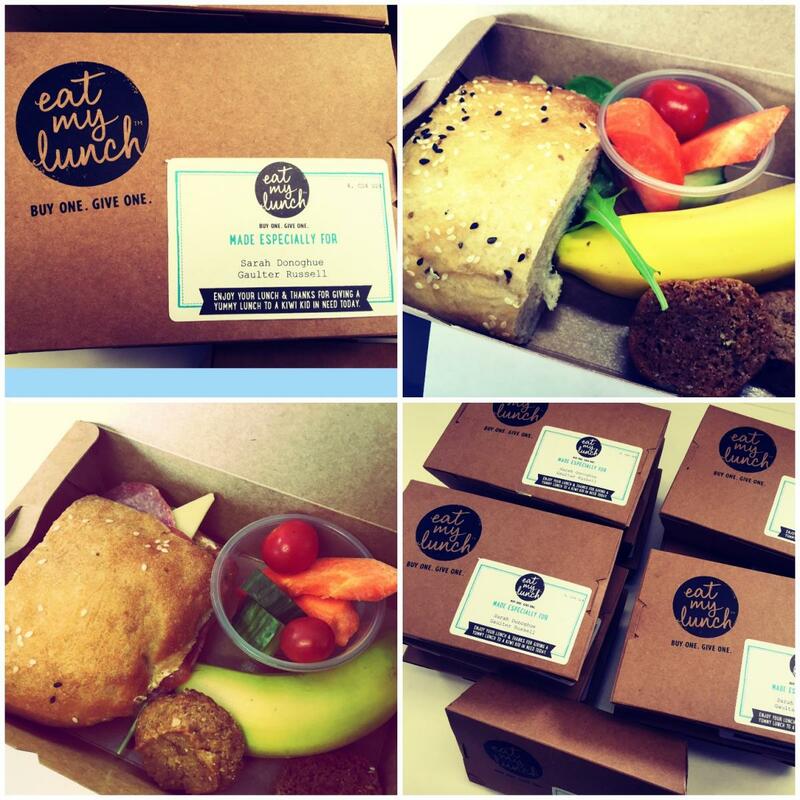 Eat My Lunch is run by a well-known chef in Auckland. You can order a nice lunch to be delivered to you at work. For every lunch you order, they will also make and deliver a lunch to a local school where lots of children don’t have lunch from home. If you don’t want to order your lunch but you’d still like children to receive a lunch, you can also ‘buy two’ – that is, you pay similar price as if you were ordering your lunch, but instead, they will give TWO lunches to the school. 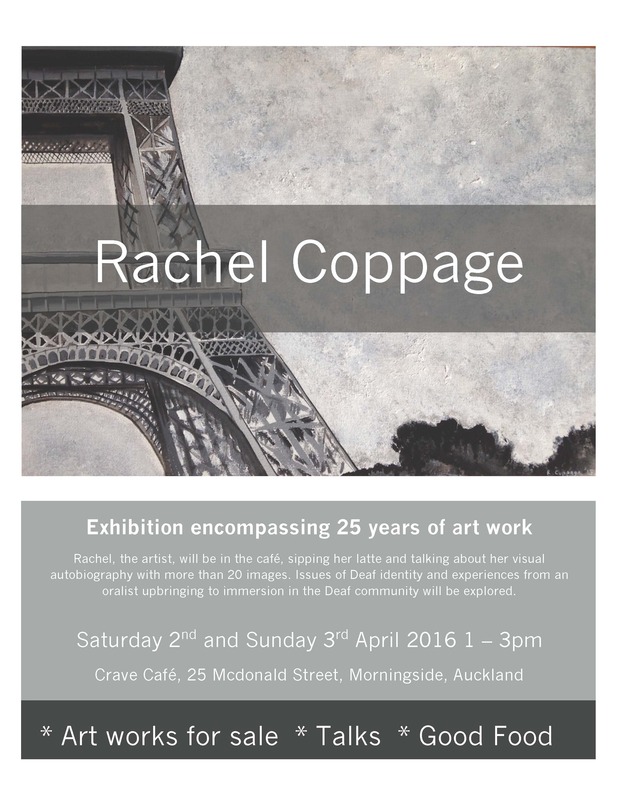 They have been doing this for about a year in Auckland and it’s very popular and they are this week in Hamilton! The first school in Hamilton they will be delivering children’s lunches to is Melville Primary. We are approaching the flu season. Influenza – or the flu – is a virus that spreads quickly from person to person. Symptoms include fever, chills, aches, runny nose, a cough and stomach upset. 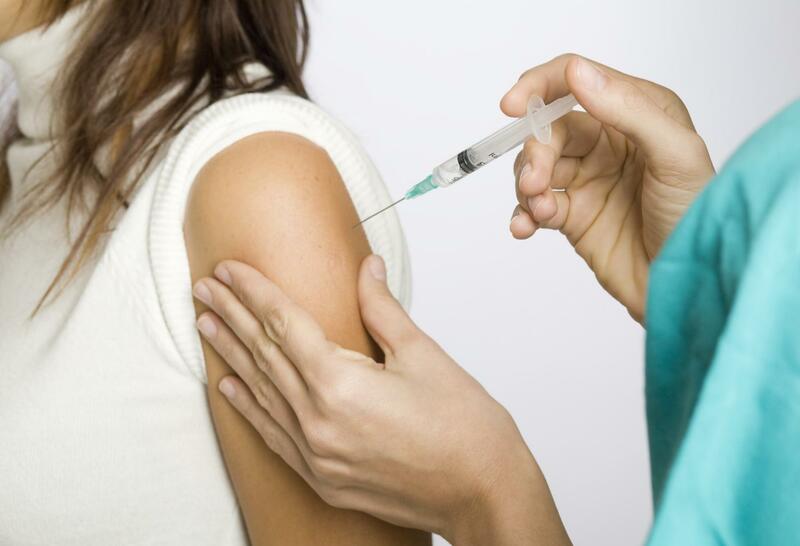 Immunisation is your best defence against the flu. If you are not eligible you can still get a vaccination at a small cost. Speak to your doctor or nurse today. An exciting combination of treasurer hunting, orienteering and geo-caching. Explore the fantastic McLaren Falls Park while looking for hidden markers. When: Friday 25th and Monday 28th March. Please note the office will not be open on the dates above. Office will open on Tuesday 29th March 9:00am. Enjoy your Easter long weekend break. 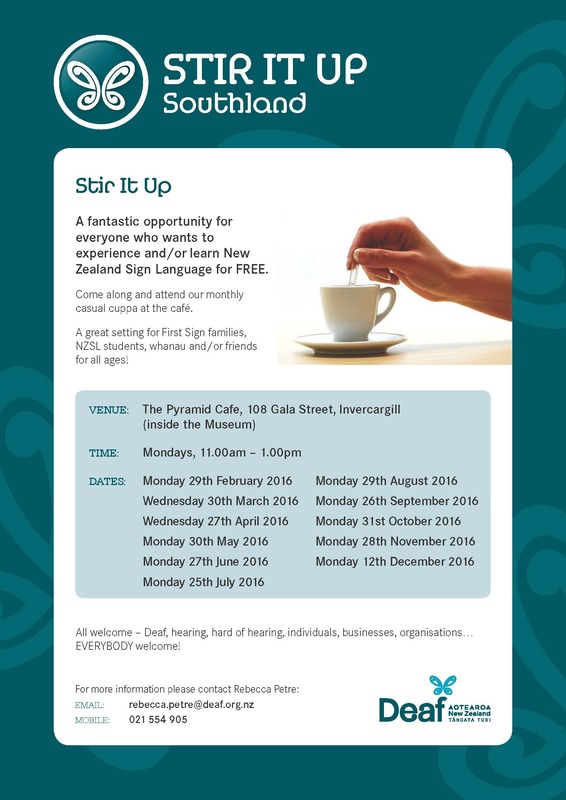 Come to this gathering, Stir It Up and have a go to learn New Zealand Sign Language or to find out more about the unique language. There will be lots of events during the Easter long weekend. Click on flyer for more information. Jazz Festival will be having their annual event at Historic Village, 17th Ave West, Tauranga on Monday 28 March from 12:00pm till 8:00pm. The theme will be “New Orleans” and there will be lots of entertainment for the whole family, a great selection of food, art and craft stalls. Cost: $15.00 for a day pass, children 14 years old and under are free. TECT cardholders free entry, gold coin donation requested for the Tauranga Jazz Society. 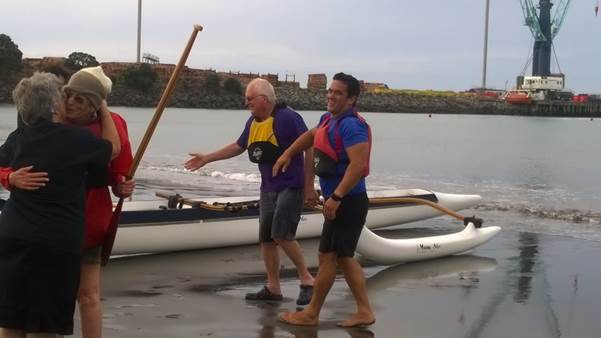 What a thrilling experience it was to go out in a waka for the first time. When I was a child I had the dubious pleasure of having to walk all the way to the beach and wade into the water to hold the boat for my father and his mates, while they went to get the tractor and trailer. Once loaded, off they would go, leaving me to walk all the way back home. There was always a "carrot" of a promise to take me out on the water, but it never eventuated. [I found out years later that my father considered it unlucky to take a female in a boat, which is why it was my brother who went, but not me. 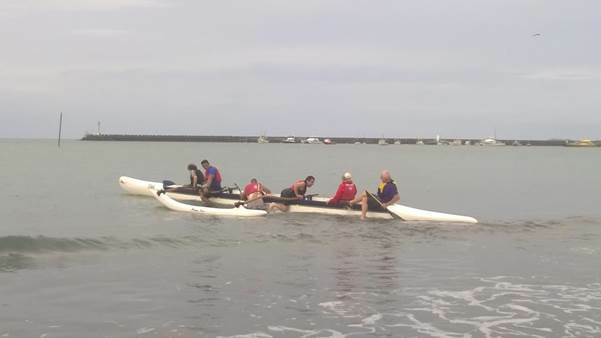 So when the occasion arose to go out on a waka, arranged by Niki, I jumped at it. 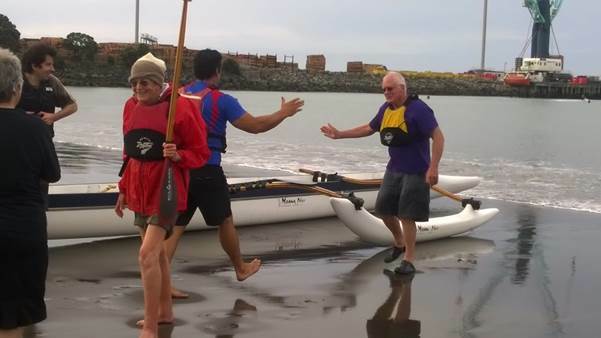 After a lesson from Taare on land, and a karakia, asking for the wind and waves to die down....and they did....our group were given turns to go out. It was rather daunting to know there was a possibility of tipping over and having to right the vessel and somehow clamber in again, but Niki assured me that would not happen. With the expertise of the lovely and encouraging Taare in the bow, I felt very safe. To skim through the water when we were all in time and paddling well was surprisingly fast and smooth. The greenish water slid by, worries and stress disappeared, and it was over all too soon. It was one of the best experiences in my life, and a big thank you to all who made it possible. When can I go out again? You are warmly invited to join David Loving-Molloy and the Catholic Deaf Community for Palm Sunday Mass in New Zealand Sign Language. Followed by a cup of tea. 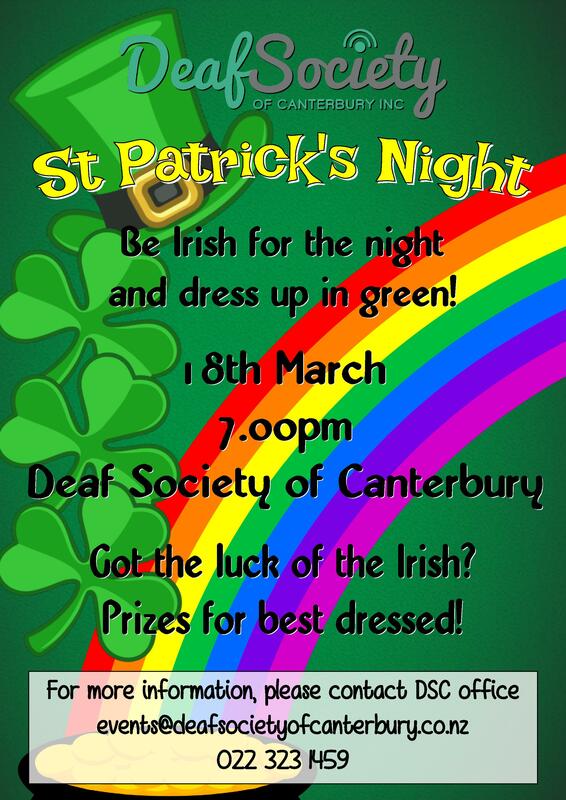 David and the Deaf Catholic community would love to see you there; bring some food to share for the cuppa. Bring your own packed lunch, togs and waterproof ears if you have any. 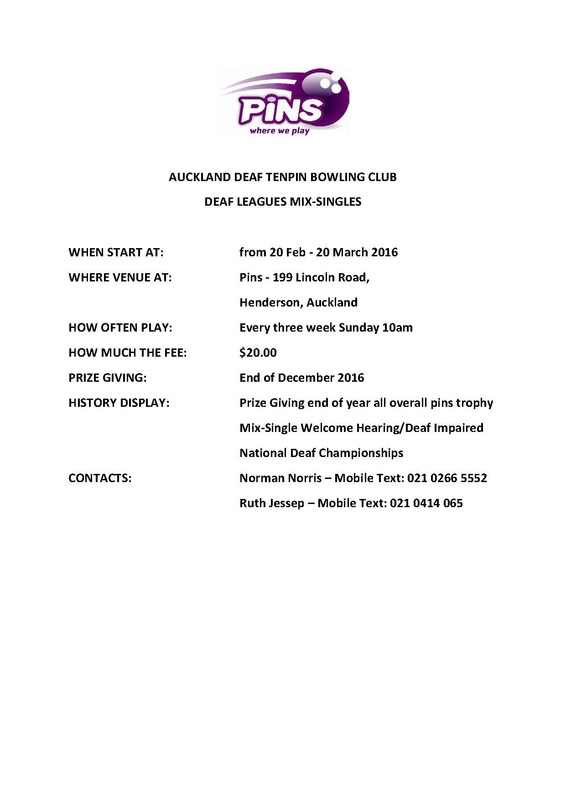 If you are a financial family from Taranaki Parents of Deaf Children your entry will be $5 per family. If not, you will need to bring enough money to pay for your entrance and hydro slides. RSVP to Madi Davy by 29th March. 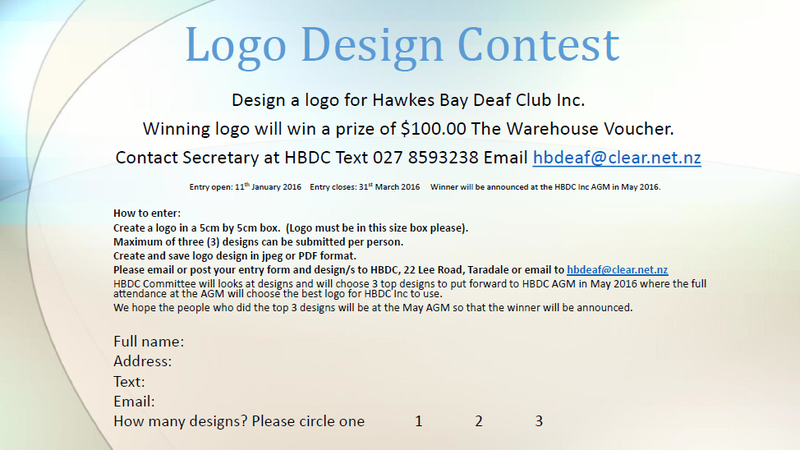 HBDC committee will look at designs and will choose 3 top designs to put forward to HBDC AGM in May 2016 where the full attendance at the AGM will choose the best logo for HBDC Inc to use. We hope the people who did the top 3 designs will be at the May AGM so that the winner will be announced. Happy Easter Hawkes Bay! Its school holiday time again and we are bringing our brand new show to town to entertain you! Check out the Ashton Family Clown Show, Puppet Show, Hoola Hoop workshops, Amazing arts, crafts, funky market stalls, loads of kids fun, food caravans, readers, tarot & Palm, unique Tiny Homes, plus much more! And best of all Entry is Free!! Come and make a whole day of it! Ft. Colour Sway, Zereda, Headlock, The Heck, Mahina Lawrence, Manaia Munro, Teilah Ferguson, Dj Hurricane - more to be announced! Come and cheer on the Hawks for their 4th Home Game! A combined auction and country fair set around the beautiful lake at Puketapu village which is being run by Taradale Rotary as a fundraiser for assistance to the community.Puketapu is seven minutes west of Taradale. The auction will sell any merchantable goods or product so if it is surplus, no longer being used or in the way, bring it along by 10:00am Sunday and we will sell it on a commission basis. The range of product accepted for auction is unlimited so bring it along. The country fair is set around the beautiful lake and established trees. There is a wide range of crafts, foods, beverages etc etc. Make a day of it, bring a picnic and enjoy the scenery, swans, ducks and fellow fair goers. Our office will be closed on Friday 25th and Monday 28th March for Easter, we will re-open again on Tuesday 29th March. If you are planning on travelling please be aware that the police have a no tolerance rule and 100km is the limit on the open road. If you notice you are holding up a lot of cars, please pull over and let them past, this will avoid any road rage or accidents. Club Nights are open every Friday from 7:30pm except for 25th March. Also MDS are trialling a new format. 3 Clubs (Social, MDS and Fishing Club) will take turns doing Club Night Cash Raffles. Our NZ Sign language week is fast approaching and we have all been busy making arrangements, organising events to happen in our area as well as ensuring that we celebrate with everyone!! 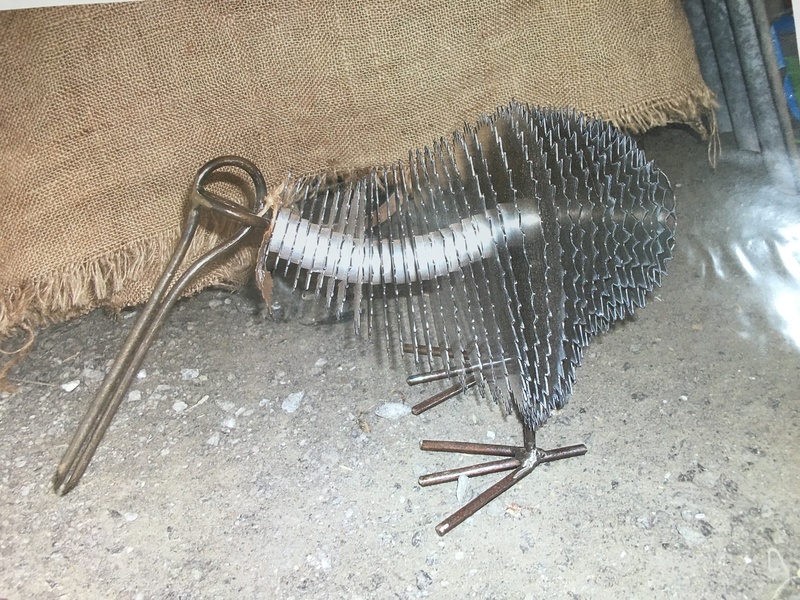 We have 3 great events comings up so watch this space…..
Wellington Deaf Aotearoa office closure, Easter Friday 25th March to Easter Monday 28th. Open again Tuesday the 29th. Please note that the AGM will be on Saturday 16th of April at 3:30pm. Please be there at 3:00pm. We will stay for dinner and a catch up afterwards. Please come along and support us. When: Monday – Wednesday 9:00am – 4:00pm. Thursday and Friday by appointment. If you are looking for a new job or are working but want a change in career. Please contact Deaf Aotearoa and they can refer you to an assessor. Once you have been assessor, one of the appointed facilitator will work with you by updating CV, cover letters and looking for work. Be Irish for the night and dress up in green. Prize for best dressed. Please inform them if you have any dietary requirements e.g. Gluten or Dairy Free. Thank you to everyone who gave feedback for TEC Workshops this year. We are going to be holding a TEC workshop on Insurance, everything you need to know about insurance policies, types of insurance, cover, excess, claims and more. This is a 2 hour workshop. Date and time to be confirmed. To register your interest for this workshop please contact Rebecca at the Deaf Aotearoa office. A reminder that Daylight savings ends on Sunday 3rd April. This means your clocks go back one hour. 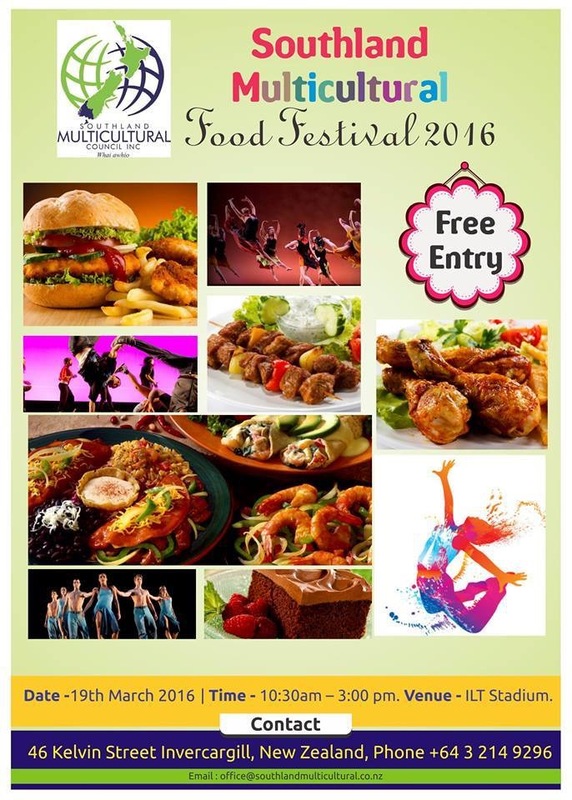 Come along over Easter weekend to a gypsy fair with market stalls, arts and craft, food and musical entertainment. For all ages. Come to The Regent Anything But Books Sale, on Friday 1st of April, to find a bargain, a treasure or a trip down memory lane. A smaller event than the Star Regent 24-Hour Book Sale but full of delightful finds and hidden gems. Rummage through DVDs, jigsaws, random household goods, toys, music, magazines – in fact, anything but books! The Deaf Aotearoa Dunedin office will closed on Monday 21st March for Otago Anniversary Day. The office will also be closed on Good Friday, 25th March and Easter Monday, 28th March. Come along and attend our monthly casual cuppa at the café. A fantastic opportunity for anyone who wants to experience and/or learn NZSL for FREE – check out the Flyer for all the Dates. Costs: At your own costs. The Office will be closed over the Easter Break Starting Friday 25th March (Good Friday) – Tuesday 29th March 2016. If anyone is interested in attending any of the events during NZSL Week 2016 Rebecca will need confirmation of numbers before the events for costing and number purposes. You will need to contact Rebecca ASAP to book your spot as numbers are limited. To register your please either email or text Rebecca. More Information to come – keep an eye out for the Flyers with all the Information. 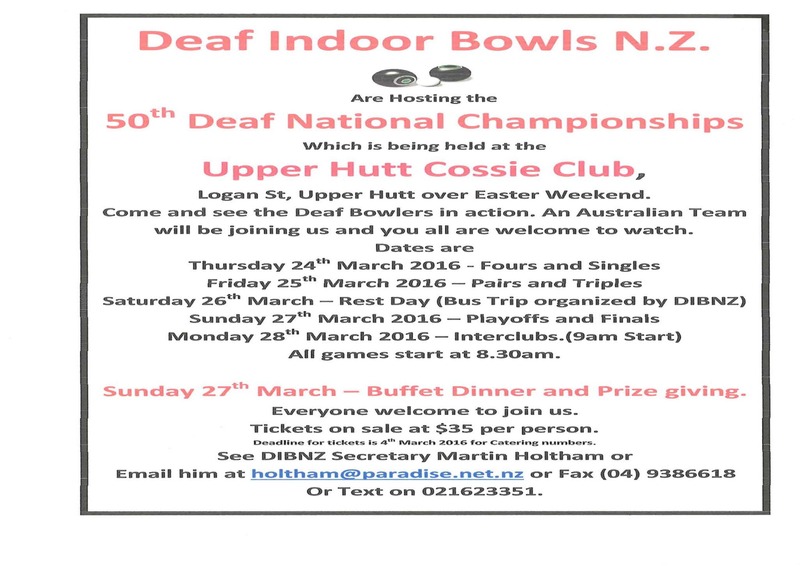 Copyright © 2016 Deaf Aotearoa. All rights reserved.